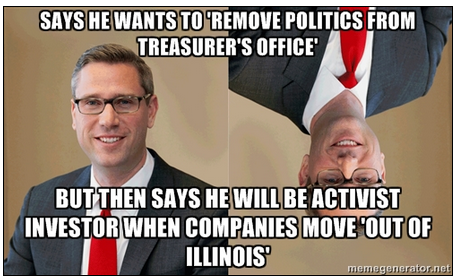 Today, in his favorite venue of Facebook, Democrat Candidate for Illinois State Treasurer is flailing about with a quote about how he 'wants to remove politics from the Treasurer's office'. 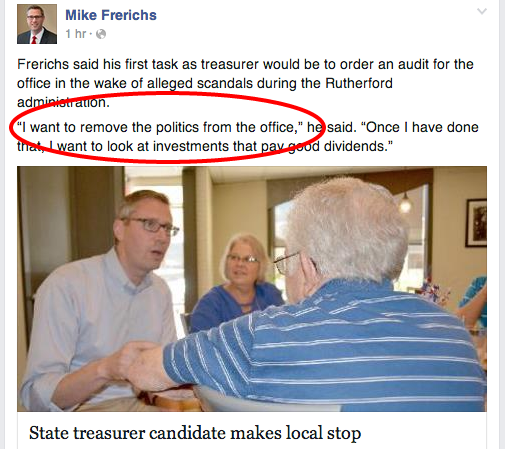 Mr. Frerichs gave no examples, but as treasurer he would be a voting member of the Illinois State Board of Investments, which handles money management for some of the state’s pension funds. So...once again, Mike says one thing one day, but says something totally different another day. In order to get out of the mess he created on his criticism of Israeli bonds, he claimed politics would rule the day. But...down in Effingham he totally forgot about it and said 'no politics' at all. What is it going to be Mike? Are you going to be an activist investor that your supporters claim is good for the State? Or...are you going to get rid of politics totally? Can we trust your answer?